It is a skilled author that can create a central character who is quite deceitful and ruthless yet still manages to have the readers rooting for him. Miguel Lienza tries to fix the markets by selling things he doesn’t actually own and even obtains credit for his schemes secretly in his brother’s name, but those who would put an end to any chances of him being successful are so much more odious and underhand that you would forgive Miguel almost anything. Miguel Lienza is a Portuguese Jew living in Amsterdam and trying to make a decent living on the stock market, at the time the most important trading floor in Europe. When the story opens Miguel is living in the basement of his brother Daniel’s house; he’s recently been down on his luck after losing a great deal of money trading in futures. Although at the time Amsterdam was regarded as a place of religious tolerance, Jews had to worship secretly and tended to stick together to protect their business interests. A small number of influential Jews sat on a committee called the Ma’hamad which made sure that the laws of the Torah were adhered to as closely as possible and were able to mete out punishment to any Jew they believed to have flouted those laws. Miguel senses his luck is changing when an independently wealthy widow, Gertruid, asks him to go into business with her. She has heard that there’s money to be made in a new commodity: coffee. When Miguel receives her proposition he is uncertain. Jews are forbidden from brokering for gentiles and, besides, he is hardly in a financial position to enter into a partnership, owing money all over the place and having over the years incurred the wrath of many of his fellow traders. But when Miguel tastes coffee for the first time he knows this is something special; the coffee seems to heighten his senses and make his brain sharp, he feels like he could take on the world. Miguel comes up with a plan that will make him and Gertruid very wealthy and starts to put it into practice but it soon becomes apparent that somebody wants to prevent those ambitions from being realised. Who knows about the scheme and why are they so keen to stop it? ‘The Coffee Trader’ is colourful and vibrant and a highly entertaining read. There’s plenty of incident and more twists and turns than you can shake a stick at. Author David Liss paints such a wonderful picture of seventeenth century Amsterdam that you can almost make out the stench of the rubbish filled canals, or hear the rumble of lively chatter in the beery taverns. I wasn’t always convinced that the language rang true but otherwise I felt that the setting and other details seemed quite authentic. There’s a wealth of detail about customs of the time, of both the Jews of Amsterdam and of the gentiles and this balanced nicely with the financial aspect of the storyline, though the latter is not dealt with so well. I’m no economist and managed to keep up in the early stages of the book but later on, as Miguel has to make changes to his scheme, I was struggling to get to grips with what he intended to do to manipulate the markets. Fortunately, you can muddle through as the writing is good enough for you to get the gist even if you don’t grasp the finer details. As for the detail around the introduction of coffee, well, this was fascinating; it is so interesting to read about the different ways in which coffee was processed for consumption in those days and the powers that people imagined coffee could provide. Technically this is an accomplished novel and the intricately woven tale moves at a manageable pace; a lesser writer might have struggled to keep the threads as neat and tidy. There’s a lot going on but this keeps things entertaining and the reader is forced to repeatedly reconsider his opinion on the various characters and their motives. If there’s a criticism to be made it’s that only the character of Miguel is explored in any depth which is a shame as the female characters, in particular, warrant some further development. An intermittent narration from a young man who has been cast out of the Jewish community worked well in linking up elements of the story but I would have liked to have seen this character with a bit more flesh on his bones too. 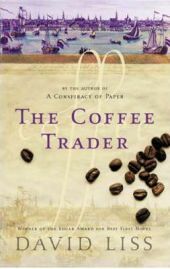 I enjoyed “The Coffee Trader” immensely; it’s a lively and colourful piece of historical thriller writing with much to recommend it. I will be certain to seek out more of David Liss’s novels and hope that I’ll find more of the same. No Comments on "The Coffee Trader"